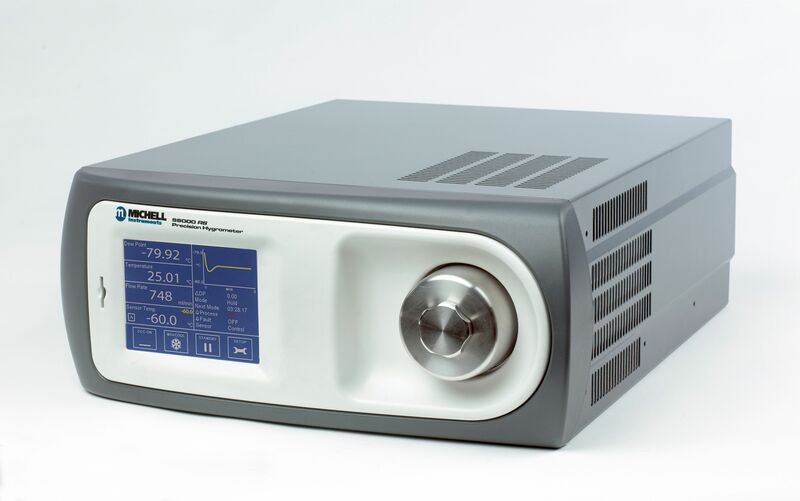 The S8000RS from Michell Instruments has proved itself as a ‘workhorse’ in many calibration laboratories and industrial settings. The S8000 RS Precision Chilled Mirror Hygrometer measures dew points down to -90°C (0.1ppm V ) with an accuracy of ±0.1°C. However, unlike many other chilled mirror hygrometers in this class, no additional external cooling equipment is needed to accurately reach these dry dew points. Designed to fit into a standard 19” rack, the S8000 is the most compact, convenient and – because it doesn’t need extra equipment to work – the most cost effective hygrometer in its class. Although referred to as ‘dew-point temperature’, chilled mirror hygrometers most often measure the frost point because the temperatures are below freezing. However, in some conditions, liquid water can exist as ‘super-cooled water’ in temperatures as low as -40°C. Because the difference in condensing temperature between water and ice can be as much as 10% of the reading, it’s essential to know which phase you are measuring. The S8000RS uses Frost Assurance Technology (FAsT) to ensure that ice, not liquid water, is present on the mirror surface at low temperatures to ensure that your measurements are always a known quantity.